Loomstate !Act Natural! Blog: Jock Docs! If you're crazy about bikes and cycling, you wouldn't want to miss a screening of A Sunday In Hell, which many fanatics claim to be the best cycling film ever made. But then again, if you're crazy about bikes and cycling, you may already know that. 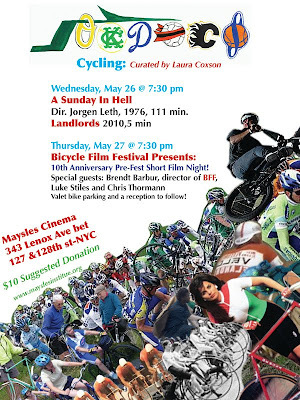 The Maysles Cinema will follow that up with a pre-Bicycle Film Festival showcase, screening a series of short films - including one about boom boxes strapped onto bikes that start impromptu dance parties in Queens! More info on the events here. The Bicycle Film Festival in NY will be from June 16th to 20th.